It's hard to keep love down, particularly during Spring Fever season. With the original hearts having been removed by work crews on behalf of developer Billy Stein, the battle for the heart of the developer, if not the hearts of residents, seems to have escalated back to the kinds of posters that used to grace the Democracy Wall. 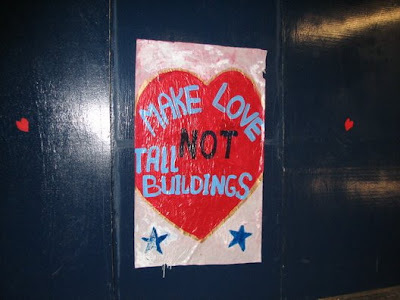 A GL reader sent us this shot of love which, clearly, urges everyone to "Make Love, Not Tall Buildings." A throwback to the Summer of Love, 2008-style? Will love triumph? Will the developer rip it down or let love rule? Stay tuned, because we're on the Love Beat. I don't get it. Is this the same artist that wrote those inane words about the revolutionary war on the construction wall down on 3rd & Bond?